Yanick Delafoge or as he is better know as Yanidel, is an international Street Photographer that has been shooting in the streets for quite some time. Originally from Orbe, Switzerland Yanidel now resides in central Argentina. When he first got interested in Street Photography he was in Paris, where he captured moments for four years. He has a very large portfolio from the capital of France with some beautiful images. After that 4 year period of shooting Paris ended, he decided to go around the world in 80 weeks with the primary goal of shooting Street Photography. His travels took him to Myanmar, India, Cuba, Turkey, Australia, Japan, Mexico, Venice, Thailand, Ecuador, Peru, Bolivia and finally Argentina. During his trips he managed to take many photographs and his overall portfolio grew in both quantity and quality. I consider myself part of the Humanist tradition yet, diverging from a purely documentary approach, I try to give a surrealist and lyric dimension to the little facts of our daily life, trying to blend in some humour and a positive spin from time to time. Yanidel has had his work exhibited and has been interviewed many times by blogs and magazines. He has also released a book, that you can read about on his website. Besides being a talented and prolific Street Photographer, Yanick Delafoge is in my opinion one of the most influential Street Photographers I know of. I have written about him previously in my blog post “The 10 most Influential Active Street Photographers”. The amount of photographs he has to share and the free knowledge he gives away on his website is priceless. Yanidel’s was the first Street Photography blog I had ever found on the web that had such useful content. You can see more of Yanidel’s photographic work on his website at http://www.yanidel.net/ and if you wish to look through his awesome gallery, you can visit http://portfolio.yanidel.net/ directly. This photograph by Yanidel has been shot in Turkey. 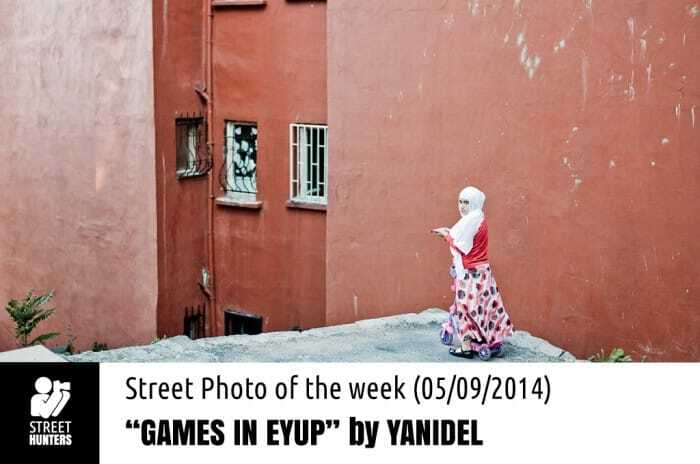 It is called “Games in Eyup” and is compositionally and technically perfect in my opinion. The walls of the buildings have been framed nicely. The water pipe falls right down the left third of the image, the right wall occupies the one half of the photo giving enough minimal background to make the subject stand out. 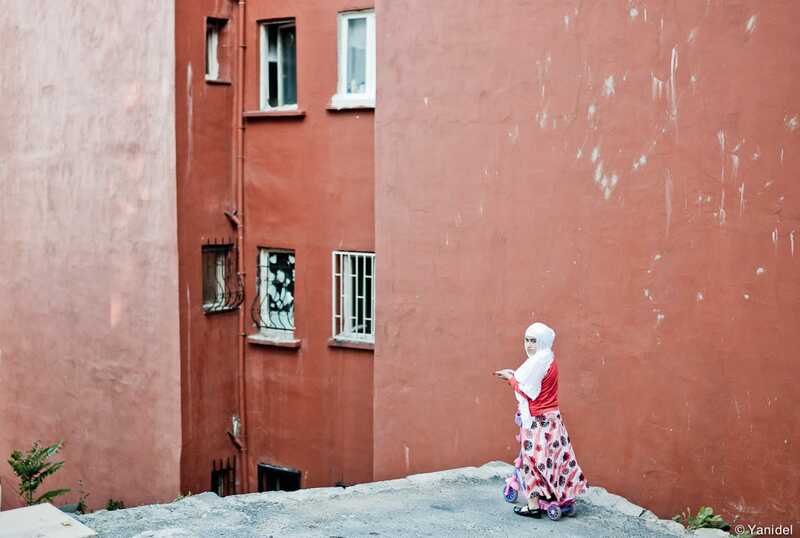 The grey ledge pops out and also enhances the presence of the girl and the two green plants on either side bring a subtle balance to the overwhelming reds of the photograph. The photograph has an amazing depth to it and lovely details. A really stunning, timeless image. I agree, Spyros, very nice composition indeed.